Earlier this week we announced some exciting new additions to the Cisco Meraki portfolio. While yesterday’s post extolled the virtues of Meraki switch stacking, today we look at the new MX84 cloud-managed security appliance and the Intelligent WAN (IWAN) capabilities that will be available in beta later this month. The MX84 follows in the footsteps of the MX64, which was released in February 2015. While the MX64 boasts higher overall performance than its predecessor and the option for 802.11ac wireless, the MX84 likewise offers a significant improvement in throughput over the the MX80, along with twice as many Ethernet ports and the addition of two SFP ports for fiber connectivity. These improvements are aimed at allowing administrators to deploy the MX84 in a variety of network designs without worrying about encountering throughput bottlenecks or having to add extra infrastructure to connect everything they want to connect – all at the same price point as the MX80. Earlier this year we announced that a series of IWAN features would be coming to the MX product line, and since then the Cisco Meraki development team has been working hard to ensure we deliver those features with the same blend of powerful functionality and simple, intuitive configuration that Meraki is known for. Later this month these new IWAN capabilities will be made available to all MX customers through an open beta. However, we want to give you a sneak peek of what configuring IWAN on the MX will look like. This straightforward policy will use preset metrics to determine what the best VPN path is for VoIP traffic. If the best link changes, traffic paths will be adjusted accordingly. 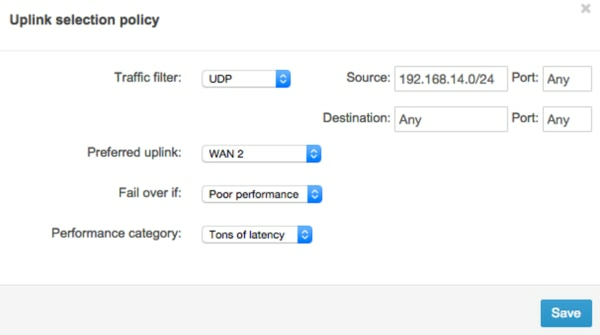 The administrator has specified a preferred uplink (WAN2), so that link will be used by default. Since performance failover is enabled, if the WAN2 link fails to meet the performance standards configured in the ‘Tons of latency’ category, VoIP traffic will be moved to the WAN1 link. Multiple performance categories can be created depending on the needs of the deployment. These are only a few examples of how IWAN features can be used to improve network performance and resiliency. Stay tuned for the open beta later this month to see the full capabilities of Meraki IWAN. If you want to know more about the MX84, IWAN, or the MS350 switches, be sure to register for one of next week’s launch webinars using the links below. How are we stacking up? Latency, Tunnels, and Peers – Oh My!